Facebook reminded me about a post I made three years ago… that had me a bit confused because I’d forgotten about it. It was a post about 36 books I wanted to read in 2016, with an “I will likely be blogging about some of them” as an aside. Wanna wager if I succeeded or not? 1) A Goodreads reading challenge (75 books to be read in 2019). I use Goodreads to keep track of the books I read, and what my progress is, so I visit the website at least a few times every week, if not daily. 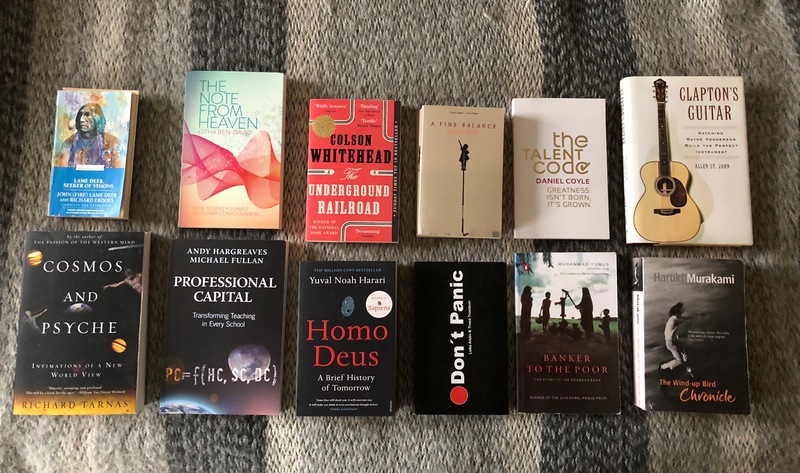 2) I wrote my intention for the year of 2019-blog post, and in it, I wrote about both the #goodreadsreadingchallenge, but also about the 12 + 12 English/Swedish books I will read this year, and that I will be blogging about two of these books every month. 3) at the end of each month, I will be posting a follow-up-post on the yearly intentions, keeping track of how I am doing. This is a vital part, because it has me reminding myself about my specific intentions at least on a monthly basis. So if all else fails, at the end of the month (or the start of the next month) I will get a kick-in-the-behind to get on track again. 4) I have these 12 + 12 books in my bedroom bookcase, and I look at them every morning and evening. Do you help yourself achieve your intentions through the structures you design and put in place, and if so, how? The sub-challenge of 2018 to read 26 English (as well as 26 Swedish) books was enjoyable, to the extent that I will do a version of it this year as well. So I’ve chosen 12 English (and 12 Swedish) books that were in my home come New Years, that I will read in 2019. Just like in 2018, I will blog about these on Sundays, once a month/blog. 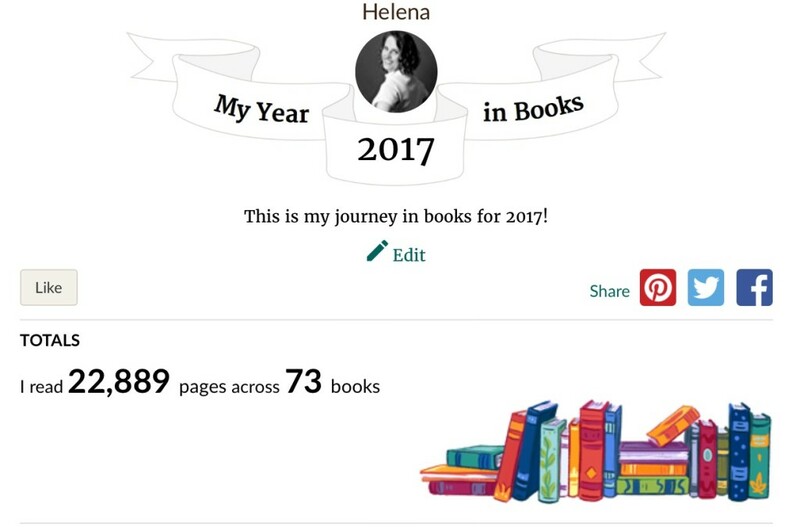 Besides this sub-challenge, my overall reading challenge for 2019 is to read (a minimum of) 75 books, and you can tag along on my reading journey over on my Goodreads-profile. A fairly good mix this year as well, and I look forward to getting acquainted with each and every one of them. Three of these I have had warming my bookshelves for quite a few years (Hargreaves/Fullan, Alsén/Troedson and Yunus) but the rest I got in 2018. I have learned my lesson from last year, and will not hold back on reading “the heavy books” until the end of the year, that’s for sure. And the heavy artillery is here, in the English section, I don’t think there are any really heavy reads amongst the Swedish ones (but hey. Who am I to guess?). Sara gave me Lame deer; D suggested Tarnas; Hargreaves/Fullan I picked up during my school activist-days; I bought Ben David at Ängsbacka during a workshop she held; Homo Deus I ordered before I finished Sapiens because I wanted to read this one as well; Don’t Panic I bought directly from Troed; my sister, and others, praise this Murakami as being his best so when I stumbled upon it at a second-hand shop, I figured I’d give it a go. Banker for the poor is, embarrassingly enough, probably an illegal book copy I bought on the streets of Mumbai ten years ago; Clapton’s guitar I found at another second-hand shop in Karlskrona during a rare in-the-flesh-Mastermind-meeting; Coyle has been recommended to me; Whitehead was my pick from the rewards for having read and reviewed x number of books for the library’s “Summer book-challenge”; and finally: A fine balance. This book is special. Since I read it (in 98? 96? In Thailand anyway, visiting my brother.) I’ve pegged as the best book I’ve ever read. (Funnily enough, my brother says the same, and still does, I brought it up with him this week when we FaceTimed.) I have yet to re-read it, but when it showed up on the shelves of a second-hand store, I thought the time has come to do just that. And to ensure I will read it thoroughly it’s also my chosen book for the Gifted book club. I wonder: will I still think it’s the best book I’ve ever read after my re-read? Have you read any of the books above, and if so, what did you think of it/them? I invest in me, with time and money – which actually is time as well. Every krona I spend comes from the time I’ve spent doing work for my customers, billing them and then paying my own salary. I invest a lot in me. 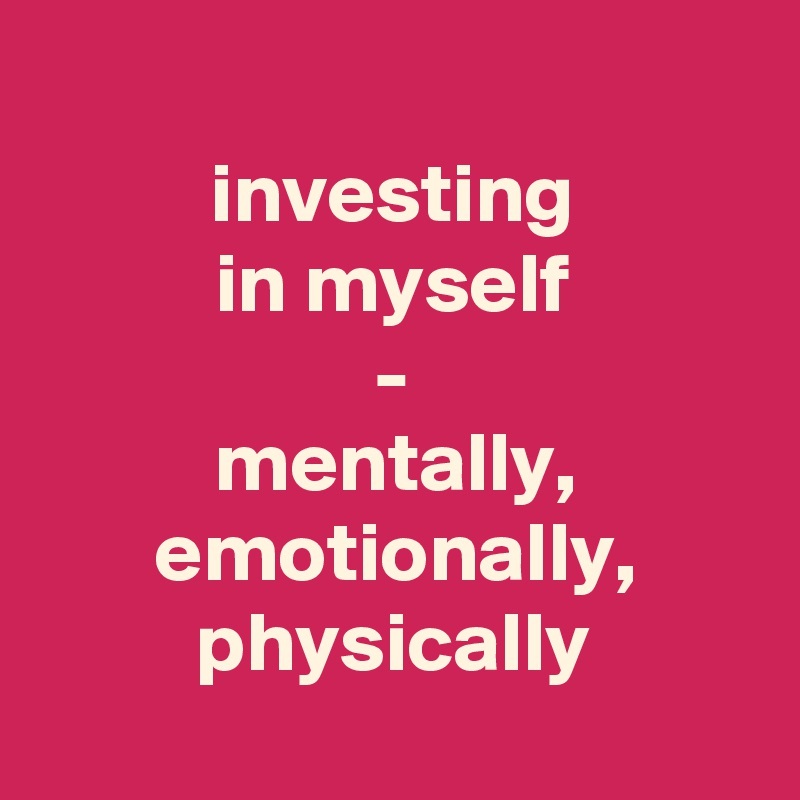 The investments I make in myself is how and what I “feed myself”, both mentally, emotionally and physically. Mentally I feed myself deliberately by listening to podcasts, reading books (94 read so far this year, with a goal of – at least – 100!) and initiating and partaking in conversations of the most diverse kind. I have just hired a new coach and I am investing a lot in myself by retaining him. Feels great! This all helps my mind expand, providing me with more perspectives than ever before, making me more prone to be able to flip things around and not go for the most obvious answers. Building a world of infinite greyscale (the color of wisdom, mind you!) rather than black and white. Being a part of Mastermind-groups and having colleagues to discuss things with is both a mental and emotional investment. And of course, spending time with those I love is an emotional investment, one that I would like to invest a bit more in, come to think of it. Physically I invest in myself by doing my morning exercise (today was day 1587 in a row! ), biking most everywhere, going for walks (I never suggest lunch or fika-meetings, always suggesting Walk N Talks instead, and CoachTalks for my coaching clients. ), jogging once a week and just recently starting to dance lindy hop. I drink my daily green smoothie and love my ginger shot, eating vegetarian food (which works fabulously for me) trying to stay away from food where the contents, the ingredients, aren’t easily understood. 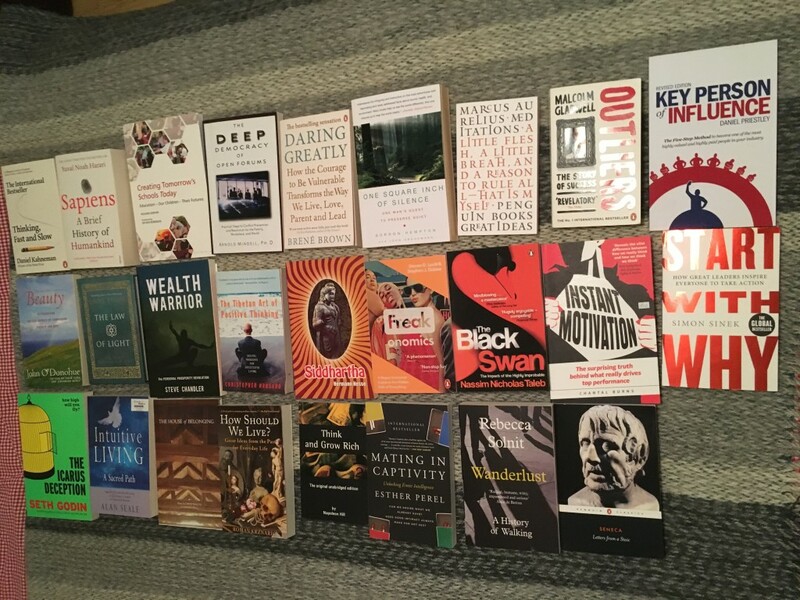 These are but a few of the investments I make in me – and guess what? It feels amazing! 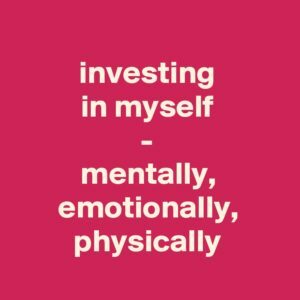 And I reflect on what I do to invest in myself now and again because just because I’ve invested in a certain way for a long time, doesn’t necessarily mean that it still is an investment worth the time. Perhaps the return on investment has diminished, perhaps it’s no longer a return I value? Do you invest in yourself? If so – how? With what? And what’s the return on investment you get from it? And if not – why? What signals does that send, to both you and others? Advent Calendar 2018 – number 21 of 24 – on the theme of being gentle. 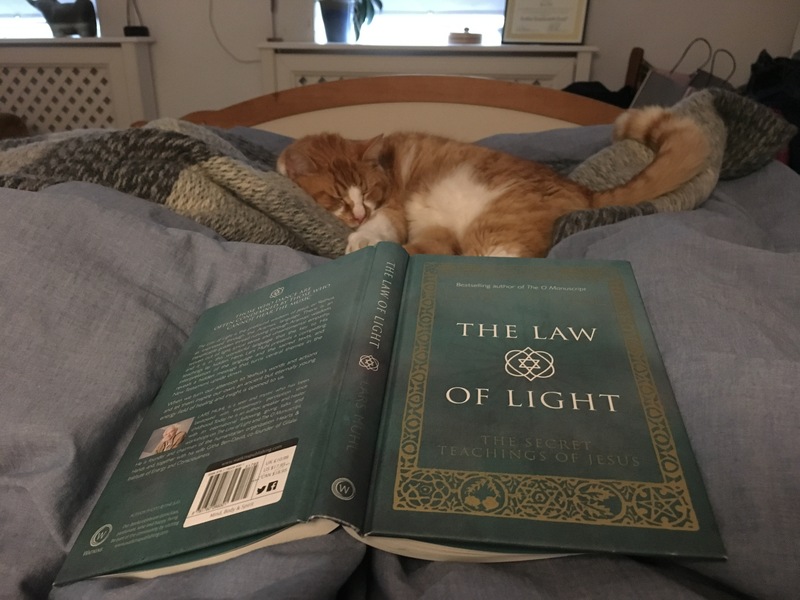 The Law of Light – the secret teachings of Jesus, written by Lars Muhl. As with The O Manuscript, Lars Muhl provides me with yet another wonderful reading experience. Not as outer worldly as The O Manuscript; but most definitely a book well worth the read. The book is… well… It contains a mix of verses out of Biblical sources paired with Lars providing explanations or perhaps rather interpretations as well as his own little gold nuggets of wisdom. The book ranges over a wide expanse, covering heavenly archetypes and mystery traditions, conscious breathing and sin, love and free will, and much much more. This is a book I already know I want to – and will! – reread. There is simply so much here that intrigues me, that resonates, that provides little glimpses into things I have barely begun to scratch the surface of. How I can relate to that. My entire recollection of childhood centered (! Yes. Past tense. Because I can change the story I tell about my childhood experience, to best serve me and those around me.) on being left out, feeling isolated and alone, observing rather than taking part. Another verse I can relate to. Ever-so-much. The rediscovery of my Self, a journey that has lasted – consciously – for the past three years. A journey that inspires me, encourages me, expands me. 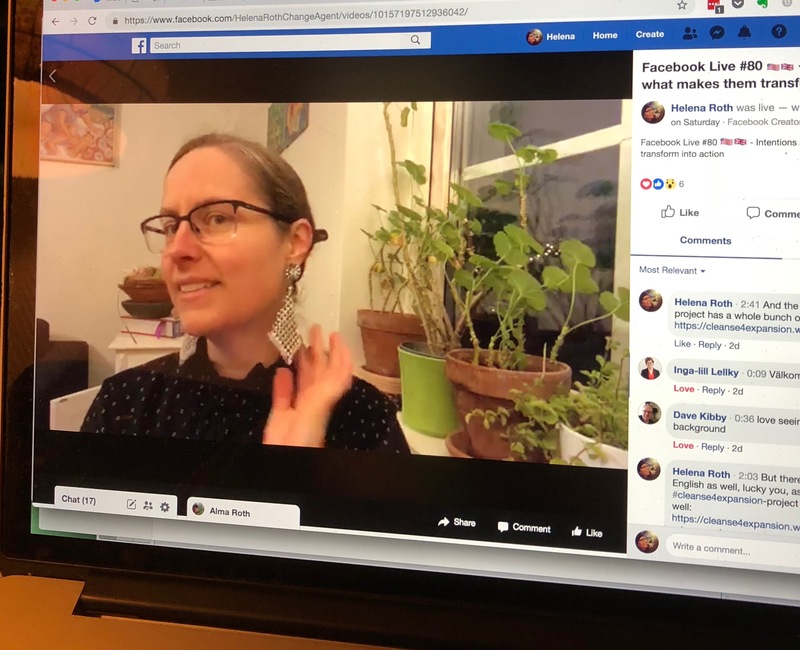 At the moment, a journey leading me on a playful dance of discovering my inner Yes (and No – but my lukewarm yeses and no’s have been frequent visitors within, those aren’t my main challenges.) which also has me saying yes and no. Stating it, plain and simple, is a challenge in and of itself. But I am getting there! 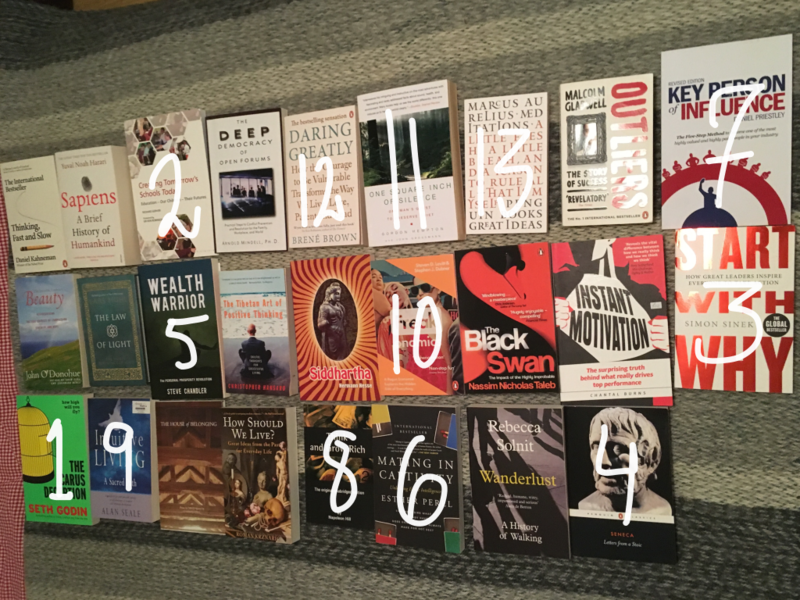 13 read – 13 to go! Every Sunday (or, well, rather every other Sunday, as I blog about my Swedish books every second week) I write a book reflection on the book of the week, which in and of itself is a treat for me. 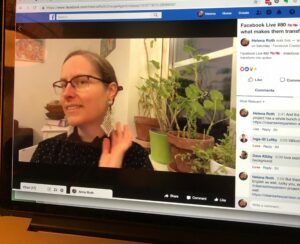 I discovered how much joy it gives me to reflect on books as I did the 2017 #blogg100-challenge when I wrote a book reflection every day for one hundred days in a row. There are so many fantastic books, and also so much thought provoking, beautiful, outrageous, troublesome, chocking, fascinating and marvelous to read in books! One of my sub targets for the year, linked with my intention to live a more intentional digital and analog life during 2018, is to read 26 Swedish and 26 English books, books that I already own. There are more books in the house, still unread that I want to read, but of the English books these 26 were the most enticing. As you can see, it’s a mix of new and old books. The Swedish collection has a more diverse touch to it, whereas this collection feels a bit heavier. However, all of these books have one thing in common: I want to read them! I pondered if I should predetermine which book to read what week, but decided against it. Have entered all the books (both Swedish and English) into my Goodreads-profile under ”To read”, so I have them there, when the time comes to move them, one by one, into ”Currently reading” before filing them under ”Read”. 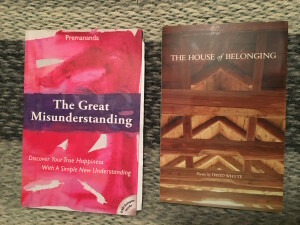 However, as I did that, I noticed that I actually already read David Whyte’s The house of belonging. So I replaced it with a book I got from a fellow Supercoach in 2014, which I’ve been intending to read ever since. I will read these chosen English books every other week, and blog about them (at least once) by the end of said week. I started off the year with a Swedish book, so you’ll just have to wait for another week before knowing which book I start with out of these 26. I continue being gengle with myself – this is a perspective upon life that I will forever carry with me. I live a more intentional life, in both digital and analog aspects – choosing what’s most fitting given the situation. digital 24-hour sabbats will become a ritual in my everyday life. Every month? Weekly? Not sure, but two per month minimum. my bedroom is a sheltered analog zone, without computers, iPads or phones, and if I need an alarm clock I will work it out with something other than my IPhone. I will not buy a single online-course based on me watching video clips and reflect on my own. It. Does. Not. Work. For Me. I have learnt this lesson now. I will, despite what I just wrote, restart and complete the “A year to clear what is holding you back” purchased during 2017. I will be going – with good company – to an “analog” writers course with Bob Hansson at Mundekulla. Pernilla Tillander and I will continue to work together – grow, learn and have loads of fun doing it – in Skurup for the ESF-project Include & Meet. I will read 26 Swedish and 26 English books, one per week: books I already own. Each Sunday I will do a reflection on either blog on the book of the week. 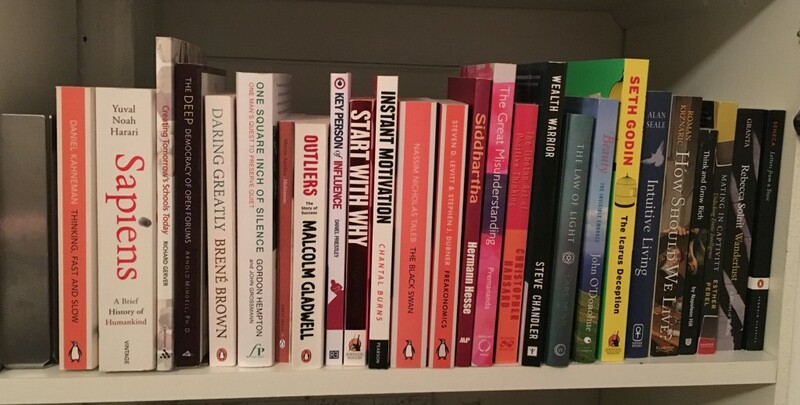 above and beyond the 52 “books I already own” I will set my #Goodreadsreadingchallenge for 2018 to one hundred books. I will let my Upholder-tendency have free reins, which you can see in the above, which for me is far from a punishment, rather, quite the challenge, something that tickles and entices me! riding my bike and taking walks, as well as my daily Seven and my Headspace-meditations, will continue to be my daily companions in life. my economic husbandry gains clarity – in all senses. What this really means is something still remaining for me to defins, so I know what it truly is I want to achieve. my eldest will graduate. Yikes. How time flies. This deserves a celebration! I – perhaps more important than anything else – will enjoy life, explore, discover, expand, and in all manners possible allow myself to have as much fun as I can! Intentions of previous years have come to me more in the form of a single word, more or less. This year is different, but if I summarize all of the above, this is where I end up: Living an intentional digital and analog life. That will be the intention for 2018. 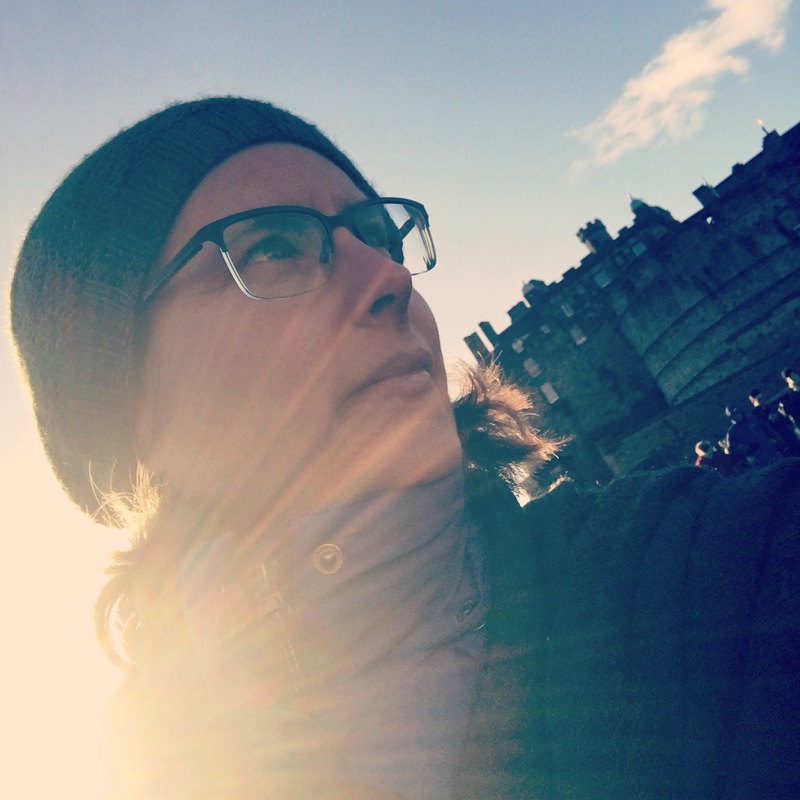 I had Wholeheartedness as my intention, something I’ve blogged about on a monthly basis since. my company Respondi AB turned ten years old. Imagine that! me and Pernilla Tillander started to work together for the ESF-project Include & Meet in Skurup, something which has been among the most fun and rewarding things I’ve done during my ten years as an entrepreneur. We will continue to work together in 2018 in Skurup and I greatly look forward to it! I did two “current state” analyses that made quite the impact, especially in me. my longest running assignment ended, after nearly five years. thoughts on my future business enterprise are starting to become clear. I rediscovered my fascination with husbandry, also in an economic fashion. the musical highlight above all else throughout my life is performing Stabat Mater by Jens Eriksson. The first performance took place already during Easter 2016, but during 2017 Stabat Mater was released on Spotify, and the church choir from Södra Sallerup performed Stabat Mater no less than three times this year. One performance took place in Salzburg where the choir went for a trip in september. Stabat Mater is on repeat at home, and I absolutely love this piece of music! my musical highlight number two took place in twofold this year as well: we recorded an album in the beginning of the year, and this was released (both as an actual CD and on Spotify) at the end of the year, Vi är i advent. Another abum running on repeat in my headphones. I turned fortyfive and discovered the thrill of hosting a potluck party – what a smashing idea! sad farewell’s were mixed with the joy of new budding lives. acting legal guardian for unaccompanied minor refugees is an ongoing assignment, a roller coaster of joy, frustration and pride; for my legal guardians as well as others. we decided to stay together but live apart… only to hand in our divorce application a few months later. far later I finally removed my wedding ring, leaving me with the feeling of a phantom ring on my ring finger. 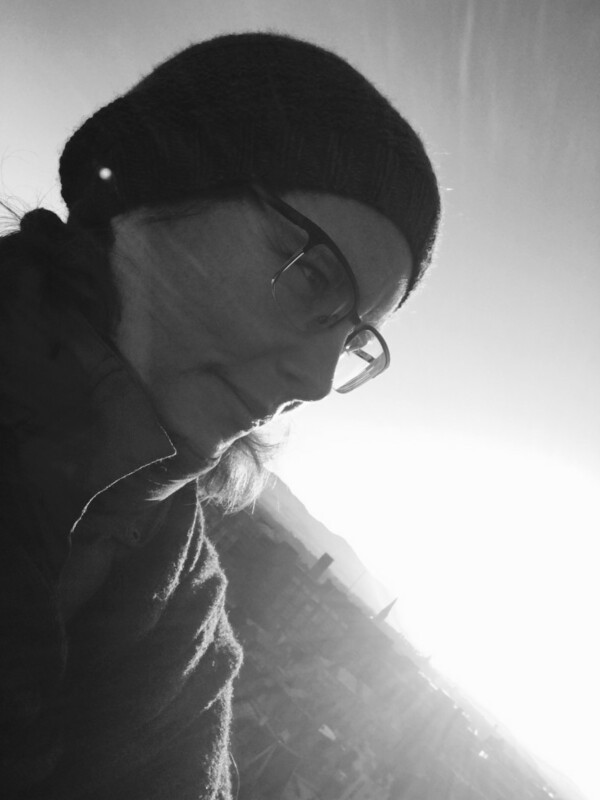 I participated in the #blogg100 challenge for the forth time, after refraining for a year. 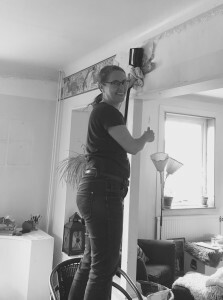 For the first time I trid blogging onehundred days in a row based on a set theme (by myself) – mixing Swedish and English blog posts – which definitely was to my liking. I have read, read, and read some more. 73 books and 22889 pages according to GoodReads. But then I also proof read a book not yet published, so in total I read 74 books and 23014 pages during 2017. My #Goodreadsreadingchallenge for 2017 was fifty books, so I reached my goal by far. The Gifted book club saw the light of day in conjunction with my birthday, and during the fall we’ve read two books. We are starting 2018 with Flow by Mihaly Csikszentmihalyi, following it up with Foe by J.M. Coetzee and I am thrilled to see what other books we will be reading after that. ChattyMeals made an entrance into my life, an aquaintance I will definitely continue to entertain during 2018. I understood my relationship to inner and outer expectations, this concept that I’ve been reflecting upon for years now, and now have an even greater understanding of, being the Upholder I am. I ran my first ever race! I tried taking a digital sabbat, which definitely wet my appetite, to the extent that it actually served as the basis for my intention for 2018.
my firstborn came of age and my lastborn turned teenager and started junior high school. Oh how time flies! for the first time in forever we stayed in Sweden during the summer holidays (o the chagrin of the kids). 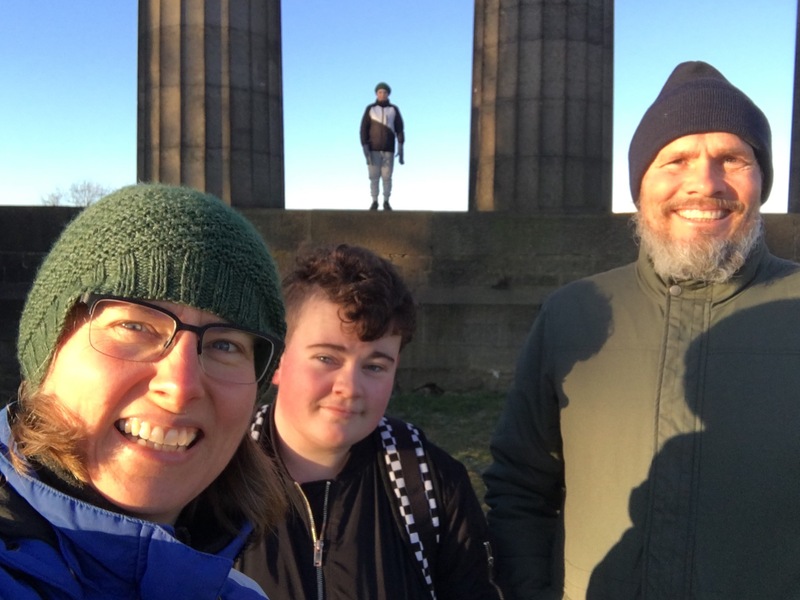 all four Roths are finishing off the year participating in the largest New Years Eve-street party in the world, the Hogmanay celebrations in Edinburgh. And with that, I wish you and yours a very Happy New Year! Being gentle to me, this past month, as been a lot about going with the flow. There’s less assignments from clients. Kids are off from school. So I am doing that which I feel like doing, and not doing the rest. Going on short excursions, overnight or just for the day. Reading books I want to read – so I am. Loads of them! Going for walks I want to take – so I do. Same with the occasional run. Haven’t felt like blogging this past week – so I haven’t. Before that, I did, daily. Borrowed a steamer and got rid of the (very ugly) paper border in the dining room, that we just never got around to removing before. That was satisfyingly hard work, as was the hedge trimming (more like a massacre really) I did together with the neighbors. Brought the guitar with me to my mom’s place, but have only played once so far. Will simply add dates at the end of my original 60 day-streak to make up for not playing daily. Not putting any guilt trips on me, for that which I’m avoiding. I just am. Same goes with that which I am doing. I just am.